Computer lock enclosures prevent unauthorized access to a system's hard drive and other internal hardware. Where multiple employees are using the same computer, and in areas where computer security is an issue, keeping tabs on all of your system's hardware could be a problem. American's custom computer lock enclosures provide the tamper-proof reliability that is a necessity in many government, education, office and manufacturing plant settings. Our computer lock enclosures will prevent unauthorized access to your system's physical hard drive and other internal hardware, while their locking bars can be adjusted so as not to hamper use of floppy disk and CD-ROM drives. American's computer lock enclosures are available for custom order to fit individual systems. 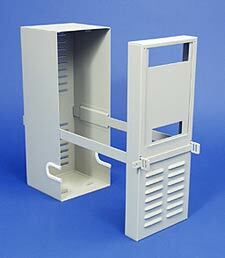 See our Custom Metal Boxes & Cases page for more details on other custom applications. Call our Sales Department today at (860) 343-1960, or toll-free at 1-800-840-9243, to discuss your computer lock enclosure needs, or fill out our online form to receive more information.